The interaction of a) this NYT article about the cost and macro-impact of Sanders’ agenda and b) a tightening Democratic primary is creating a fair bit of buzz. I’m accurately quoted in the piece making a few points (paraphrasing here where I have more space! ), but some readers have misinterpreted my position as an endorsement or anti-endorsement. Not so. –Sanders’ policy aspirations mirror many of those I write about here: deep infrastructure investments, efficiency improvements in health care, college affordability, and so on. FTR, Clinton’s do too, though she dials back the extent of her proposed interventions. She’s admittedly more of an incrementalist as her theory of change is much more path dependent than Bernie’s. (Path dependency: your options in terms of where you end up depend on where you’re starting from.) I return to this important difference below. –If you roughly sum up the costs of what Sanders is proposing, you will find that federal government spending under his agenda grows to something like 30% of GDP instead of the historical average of around 20%. That’s not at all unheard of in European and Scandinavian social democracies, as the candidate himself often notes. It is, however, as I suggested in the piece, unheard of in our own history. Again, that’s one way to interpret his call for a “political revolution.” And it’s more evidence of his path-non-dependency. –I did not find the macro estimates of Bernie’s agenda by economist Jerry Friedman, who, according to Dean Baker is “not affiliated” with the Sanders’ campaign, very plausible. I do give Friedman credit for running all of Sanders’ plans through a macro model, versus Republican candidates’ hand-waving claims that the power of their personalities leavened with massive sprinklings of supply-side fairy dust will generate GDP growth of 4, 6, 8 percent! But such models are a function of your assumptions, and his, including his multipliers, the sharp increase in labor supply and productivity, diminished health care inflation, and a passive Fed amidst all this stellar growth, all seemed way too sunny to me (I called them “wishful thinking” in the NYT). Isn’t that a non-endorsement? Fair question, but no, it’s not. What I do here, there, and everywhere is analyze economic policy, very often through a political lens (ergo, political economy). It would go far beyond my scope to endorse a candidate. It would also compromise my ability to call it like I see it. Yes, I ding conservatives a lot more than progressives, but a) “duh” and b) I ding and praise them all accordingly. As an aging pundit who’s spent decades here at the intersection of dysfunction junction, both in and out of government–I’ve seen the sausage made at every level, people, and damn…it ain’t pretty–I too am drawn to path dependency and incrementalism. I’ve seen lots of market failure, but I’ve seen government failure too. And yet, I would strongly constrain my criticism of those who feel otherwise. I admire their hope, their aspirations, the fact that they’ve had it with incrementalists posing as revolutionaries. I agree with them that we need a new model, as the current one is, in many ways, working as badly as I’ve seen it work. Moreover, while I think it’s absolutely right to look at the details and question the implications of the candidates’ numbers, not to mention whether they add up, one can push that too far. Look at their aspirations, their role for government, their tax plans (do they raise needed revenues or just cut taxes? ), their views on trade (do they acknowledge both winners and losers? ), inequality, poverty, the depth of their reconnection agenda, and mostly: are they WITTs or YOYOs? And, in the current case, evaluate for yourself how heavily to weigh path dependency. Krugman gives it a very heavy weight. Baker less so. I give it a heavy weight with regard to health care–defend the ACA against the marauding hordes!–build on its successes so far!–perhaps because I was there in the sausage factory when we somehow managed to pass the damn thing. But beyond that, I’m not sure how heavily to weigh path dependency. Perhaps that will become clearer as time progresses, though I suspect not. Either way, I’ll be here doing political economy, sans endorsements, in the hopes of informing anyone who’s interested. Share the post "I endorse…"
17 comments in reply to "I endorse…"
Jared, your point of view and your data are far more valuable to me than are those committed to party or candidate. Please don’t change. I mean, you could have had an average of 10% for half that time and 30% the other time and you’d have an average of 20%. Not to discount the average entirely, but the trajectory does matter. We’ve gone from a low of 13-15% to a high of 23-25% over a 60 year period; it’s plausible that that trajectory could continue, or even accelerate, under the right conditions. Why do you include the 1950? Do you think there is any senario were we go back to a govt share of GDP that small? Does Hillary have any specific proposals on how to build on the ACA? On how to get universal coverage? What does the ‘dependant’ path offer millions who can’t afford to see a doctor? Is the ACA -buy off the rentiers – path to universal coverage really going to be cheaper? Remember the rules are we can’t increase gov share of GDP on this path. So it just never happens? Your data is out of date. 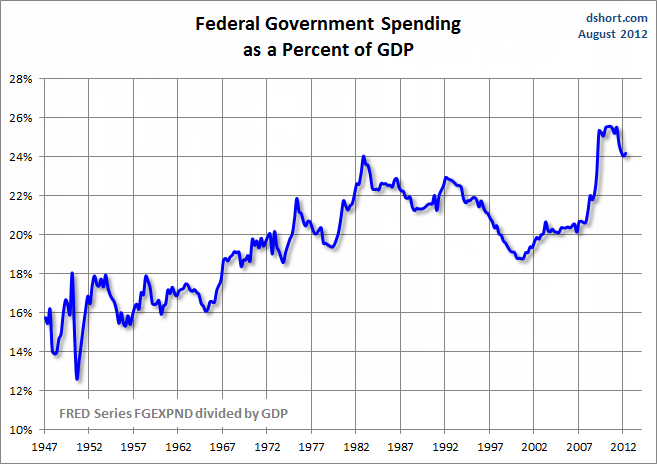 If you updated your chart to include 2013 & 2014 (fiscal years) you would see that spending drops back to 20% of GDP. Including the most recent years makes the average from 1950 to 2014 the 19.5% Jared posts. the main reason spending was such a high percentage in the last years of your chart was much more weak GDP, rather than strong spending. Having tried to make health care sausage here in NH (unsuccessfully), to have fortunately been overtaken by the ACA (always needed many more federal dollars in the mix), I have become very leery of great aspirations (I, too, use to dream of single payer) but now I’m just trying to imagine a path to a state public option. Like, put all the public employees state-wide (state, county, municipal, teachers, firemen etc.) into one insurance pool, then add in all Medicaid enrollees (so far we’ve only used already dedicated tax dollars), then offer this on the Marketplace to individuals and small business (more federal dollars via subsidies). Do we have a working state public option? Will CMS give us a waiver? Will we be able to negotiate directly with all willing care-providers for standard rate setting? PS. I do like your realism on all issues. Thanks for this post. To me, Krugman, who is usually a very serious analyst, has been particularly frustrating over the past month for making VSP-like arguments. He finally offered some substantive criticism today but it was a long time coming. IMO, your post above has more meat to than all of his combined over the past month. A related comment and question: I presume that predictions of what we might save by going to single-payer (or by sticking with ACA) are functions of future GDP, labor force participation, unemployment, and other factors. What’s the sensitivity of predicted per capita health spending and fraction of GDP to those factors. More specifically, if you run a macro model with more plausible numbers than Friedman used then do you get significantly different results? Health spending is now about 17% of GDP and roughly $8.5k/person, yes? Can you exercise a macro model – or multiple models – and come with a plausible probability distribution function for pct GDP and per capita spending over time? Perhaps not but if it were feasible it would be interest to see the forecasts. I’d be interested in the distribution functions as well as mode (or mean or median) vs time for each distribution. Jared Bernstein, I really appreciate your analysis. This is fair criticism. *Academic* criticsm. I was pointed to this from a discussion in the current kerfuffle. Where I have been very disturbed by how little of actual academic criticsm I’m seeing among academics I used to respect. I was shocked and offended by the so-called “open letter” by Romer, Krueger, Tyson, and Goolsbee which contained *absolutely no analysis or data whatsoever* and simply expressed disapproval of Friedman’s analysis — based on what, instinct? This offensive non-analysis was followed up by claims by Brad DeLong that we must “hold the line on analysis” by supporting the open letter with no analysis and opposing Friedman’s analysis? Krugman proceeded to spout the same party line of content-free attack along with some handwaving about <4% unemployment being unlikely (it happened in 1999), 5.3% growth being implausible (Christy Romer has written entire papers about time periods when it happened such as WWII), and the employment/population numbers being down primarily due to retirement (which doesn't seem to fit the data). …but this didn't cause any of the people trumpeting Thorpe's analysis to stop doing so. Because facts apparently don't matter? I think all of us can only be made stronger by proper, evidence-based, analysis-heavy academic criticism. But we can be made a lot weaker by evidence-free "open letters" making arguments from authority. Most people aren’t wonks like us. I would tell them that Friedman’s numbers are overblown and probably won’t come true but who believes that Sanders would get his entire agenda through? I would challenge the notion that Hillary and Sanders want to end up at the same place, but only differ on the rate of change. Where is the evidence? Hillary wants to win the general election and so she’ll promise liberal Democrats she wants lots of change and in the general she’ll promise moderates that she’s moderate and doesn’t want the US to be like what Sanders envisions. My guess is that she’ll be like Bill Clinton and Obama and other establishment Democrats. Much better than Republicans and Obama was better than Clinton, so hopefully she’s more like Obama. For instance she made up her mind kind of late on TPP. Obama pushed it. Clinton pushed through NAFTA etc. Sanders criticized the Fed. Hillary has said nothing about the Fed. I think wonk fairness requires that people subject BOTH Sanders’s and Clinton’s plans to impact analysis. If one believes that there is either (1) a large gap from potential GDP, or (2) secular stagnation, what is the optimal policy? (All of this may be politically unrealistic, but if we want to discuss OPTIMAL policy, this is what the discussion should be.) What investments in what $ amount would best reduce output gap or reduce secular stagnation? If Sanders’s proposals are too large and have been oversold by Friedman, are Clinton’s proposals too small-bore? I think it would be fair to ask the ex-CEA folks, Larry Summers, Paul Krugman, and Brad DeLong: what is your model of the output gap and secular stagnation? What is optimal policy? How do Sanders’s plans and Clinton’s plan compare with that optimal policy? I’m not going to get pulled into a discussion of this with someone that seems pretty objective already, like Jared. Unfortunately, I think that within the Democratic party, with Hillary as the favorite, meaningful discussion has stopped. The establishment doesn’t want to try to explain why they couldn’t come up with anything better than a Republican-style ACA bill that just doesn’t work very well. They don’t want the embarrassment of having to refute another person’s numbers by creating numbers of their own, because then they will have a stance to defend and this could become a real discussion. The point, clearly is not to have a discussion. It is to shut down all discussion of these topics by pulling rank and name dropping. Unfortunately (or fortunately) I was never very impressed with the names or the ranks. Objectively, this entire episode is shameful, dishonest and unworthy of a candidate that deserves the White House. I’ll will not vote for Hillary. No matter what. The Cossack work for the queen.